Not to be confused with Holiest sites in Shia Islam or Holiest sites in Sufi Islam. Kaaba and Al-Masjid al-Haram, Mecca, Saudi Arabia. According to Sahih al-Bukhari, Muhammad said "Do not prepare yourself for a journey except to three Mosques: Masjid al-Haram, the Mosque of Aqsa (Jerusalem) and my Mosque." In the Islamic tradition, the Kaaba is considered the holiest site, followed by the Al-Masjid an-Nabawi (The Prophet's Mosque) and Al-Aqsa Mosque. Masjid al-Haram ("The Sacred Mosque"), is a large mosque in the city of Mecca, and the largest in Islam. It surrounds the Kaaba, the place which all Muslims face each day in prayer, considered by Muslims to be the holiest place on Earth. The current structure covers an area of 356,800 m2 (3,841,000 sq ft) including the outdoor and indoor praying spaces and can accommodate up to 820,000 worshipers during the Hajj period. During the Hajj period, the mosque is unable to contain the multitude of pilgrims, who pray on the outlining streets. More than 2 million worshipers gather to pray during Eid prayers. According to the teachings of Islam, God, in the Quran, used the word mosque when referring to the sites established by ʾIbrāhīm (Abraham) and his progeny as houses of worship to God centuries before the revelation of the Quran. The first of these spots is Masjid al-Haram in Mecca and the second is Al-Aqsa Mosque in Jerusalem. 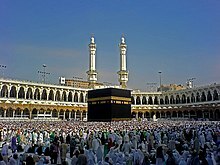 Before Mecca and Jerusalem came under Muslim control between 630 CE and 638 CE, the site of the Kaaba, which (according to Muslim belief) was established by Abraham and Ismail, was used by non-Muslim Arabs who worshiped multiple gods. And when We assigned to Ibrahim the place of the House, saying: Do not associate with Me aught, and purify My House for those who make the circuit and stand to pray and bow and prostrate themselves. And remember Prophet Abraham and Isma'il raised the foundations of the House (With this prayer): "Our Lord! Accept (this service) from us: For Thou art the All-Hearing, the All-knowing. Al-Masjid an-Nabawi in Medina, Saudi Arabia. Al-Masjid an-Nabawi (Arabic: المسجد النبوي, pronounced [ælˈmæsdʒidæˈnːæbæwiː]) or the Mosque of the Prophet, located in Medina, is the second holiest site in Islam. The edifice was originally the house of Muhammad; he settled there after his migration to Medina, and later built a mosque on the grounds. He himself shared in the heavy work of construction. The original mosque was an open-air building. The mosque also served as a community center, a court, and a religious school. There was a raised platform for the people who taught the Quran. The basic plan of the building has been adopted in the building of other mosques throughout the world. Subsequent Islamic rulers greatly expanded and decorated the mosque. The most important feature of the site is the green dome over the center of the mosque, where the tomb of Muhammad is located. Constructed in 1817 CE and painted green in 1839 CE, it is known as the Dome of the Prophet. Early Muslim leaders Abu Bakr and Umar are buried beside Muhammad. Medina is also home to the historically significant Quba Mosque and Masjid al-Qiblatayn. Al-Aqsa Mosque is sacred because the first of the two Qiblas (Arabic: اولى القبلتين) was Jerusalem. In Islamic tradition, Al-Aqsa is said to be the second Masjid (Arabic: ثاني المسجدين). The mosque is also the third of the two holy Sanctuaries (Arabic: ثالث الحرمين), under Islamic Law. The term used for mosque, "masjid", literally means "place of prostration", and includes monotheistic places of worship but does not exclusively lend itself to physical structures but a location, as Muhammad stated "The earth has been made for me (and for my followers) a place for praying...". When Caliph Umar conquered Jerusalem after Muhammad's wafat, a prayer house was built on the site. The structure was expanded by the Umayyad caliph Abd al-Malik ibn Marwan and finished by his son al-Walid in 705 CE. The building was repeatedly destroyed by earthquakes and rebuilt, until the reconstruction in 1033 by the Fatimid caliph Ali az-Zahir, and that version of the structure is what can be seen in the present day. This same area was called at later Islamic periods as the Noble Sanctuary. It is believed by many to be the area from where Muhammad is said to have ascended to heaven, although other theories claim it had been from a mosque in Medina, Jir'ana or Kufa. Although most political references to the Al-Aqsa Mosque date from the 12th century or later due to its occupation by the Crusades, others claim that the mosque's position in Islam is firmly grounded in a number of hadith dating from the birth of Islam. While Jerusalem is not mentioned by name in the Quran, it is recognized as a sacred site based on several references that have been linked to Jerusalem by later Islamic traditions such as the hadith. Some academics attribute the holiness of Jerusalem to the rise and expansion of a certain type of literary genre, known as al-Fadhail or history of cities. The Fadhail of Jerusalem inspired Muslims, especially during the Umayyad period, to embellish the sanctity of the city beyond its status in the holy texts. Others point to the political motives of the Umayyad dynasty which led to the sanctification of Jerusalem in Islam. Later medieval scripts, as well as modern-day political tracts, tend to classify al-Aqsa Mosque as the third holiest site in Islam. For example, Sahih al-Bukhari quotes Abu Darda as saying: "the Prophet of God, Muhammad said a prayer in the Sacred Mosque (in Mecca) is worth 100,000 prayers; a prayer in my mosque (in Medina) is worth 10,000 prayers; and a prayer in al-Aqsa Mosque is worth 1,000 prayers", more than in any other mosque. In addition, the Organisation of Islamic Cooperation, refers to the al-Aqsa Mosque as the third holiest site in Islam (and calls for Arab sovereignty over it). ^ Lindsay, James (2005). Daily Life in the Medieval Islamic World. Greenwood Press. pp. 142–143. ISBN 0-313-32270-8. ^ "Islamic History of Masjid Al Aqsa". Retrieved 14 April 2017. ^ "Eyewitness: Inside al-Aqsa". BBC News. 2002-03-20. Retrieved 2010-05-04. ^ al-Waqidi, Kitab al-Maghazi 9th century (Oxford UP, 1966, vol. 3, p. 958-9). Jirana, which Muhammad visited in 630, is about 10 mi (16 km) from Mecca. ^ Talhami, Ghada Hashem (February 2000). "The Modern History of Islamic Jerusalem: Academic Myths and Propaganda". Middle East Policy Journal. Blackwell Publishing. VII (14). ISSN 1061-1924. Archived from the original on 16 November 2006. Retrieved 17 November 2006. ^ Silverman, Jonathan (6 May 2005). "The opposite of holiness". Retrieved 17 November 2006. ^ "Resolution No. 2/2-IS". Second Islamic Summit Conference. Organisation of the Islamic Conference. 24 February 1974. Archived from the original on 14 October 2006. Retrieved 17 November 2006. Shimoni, Yaacov & Levine, Evyatar (1974). Political Dictionary of the Middle East in the 20th Century. Quadrangle/New York Times Book Co.
Zabeth, Hyder Reza (1999). Landmarks of Mashhad. Alhoda UK. ISBN 964-444-221-0.